Maybe the full title of “Marat/Sade” wins but “A Funny Thing…Forum” probably comes in third to Stray Dog’s holiday show, “The Butterfingers Angel, Mary & Joseph, Herod The Nut And The Slaughter Of 12 Hit Carols In A Pear Tree” for the longest title in theatre history. Devised by, of all people, William Gibson of “The Miracle Worker” fame, this was originally a pageant for Christmas written for his church. Now Stray Dog takes it on as a nice alternative to the myriad of holiday shows that have become more common this time of year. Unusual perhaps but it takes a more human approach to this familiar story. First of all, wouldn’t Joseph be a little more upset and less gullible when Mary hands him the news that she’s pregnant via a “virgin” birth? What about Mary? Seeing the other ladies in her village and their struggles with the youngsters, couldn’t she be a little more reluctant to having this baby even knowing it’s The Savior? Well these, and many more questions are asked as we travel to Bethlehem with this duo along with inanimate objects and animals taking on human qualities. Throw in a less than remarkable Angel Gabriel who is treating it all like a Cecil B. DeMille production and you’ve got the makings of a very, very non-traditional Christmas story. Stray Dog Theatre’s Artistic Director, Gary F. Bell, has tackled this unusual script with vigor , tongue firmly planted in cheek and the realization that this version may be closer to the truth. Playing the title character (at least the first name in the title) is Joseph Corey Henke as the Butterfingers Angel who has trouble handling more than one thing in his hands at a time- a serious case of “dropsy.” He delivers the news to Mary and then begins to worry when things don’t always go according to the massive script he’s toting around with him. As Mary, Colleen M. Backer delivers her lines with a droll, off-hand style that just adds to a personality closer to a stand up comedian than the Mother Of Our Lord. It’s a delightful performance that mixes sincerity with an insincerity in just the proper levels that make the lady as lovable as she is hilarious. 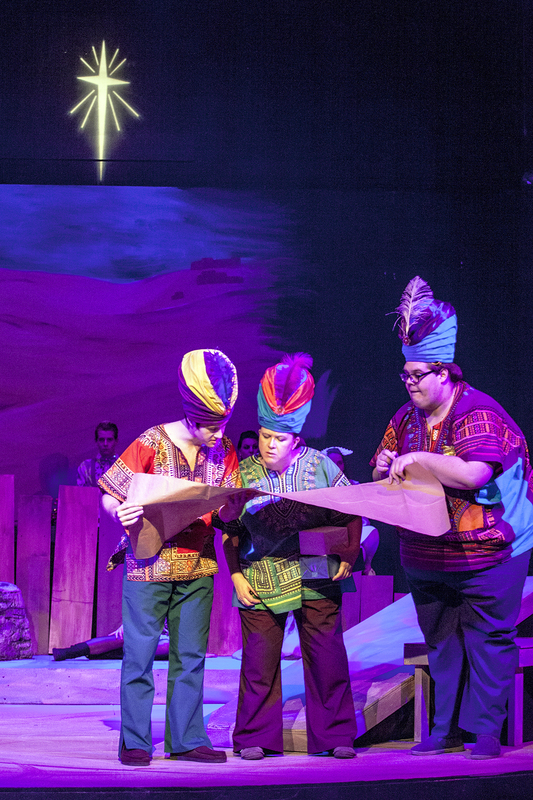 Stephen Peirick is just as effective as the somewhat reluctant Joseph. Never fully trusting the outrageous story of how she got pregnant, he even accuses the “annunciating” angel of being the father- a fact that appalls angel and audience alike. John Reidy tackles several roles including Herod (in this version he’s given the additional moniker of “The Nut”). It’s easy to see why as he’s a drum aficionado who prefers the “skins” to be real, human skin. Another stand-out in the cast is the hilarious interpretation by Alyssa Ward as a tree. Not only a tree who talks, but one who prefers to be dressed in a “bark” of real fur and apparently can decide to be a pear tree, cherry tree, fully blossomed or barren at the drop of a limb. 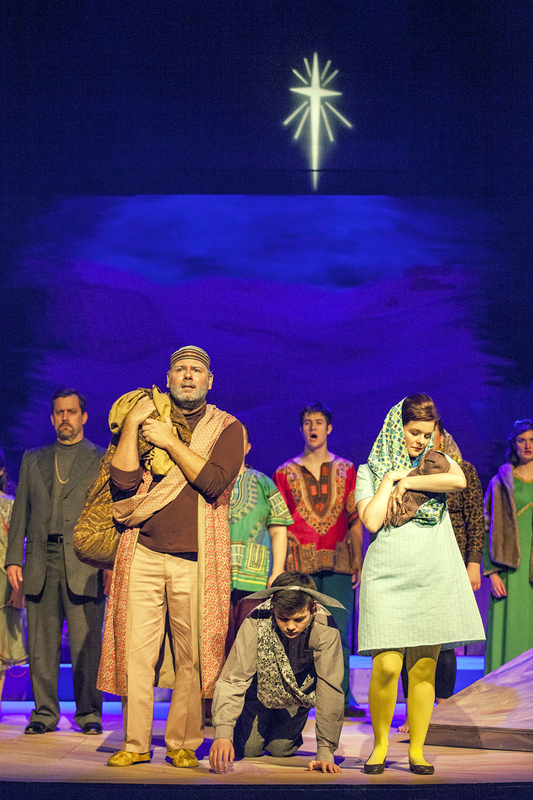 Sarajane Alverson and Ashley D. Alcamo are two women of the town who sympathize with Mary and provide some divine singing of the 12 Carols in the title with able assistance from the rest of the cast. 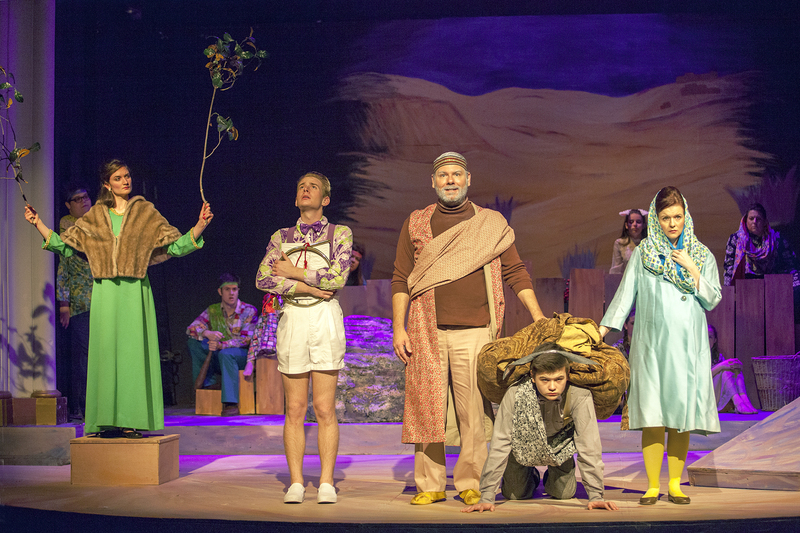 A mix of children and adults round out the large cast playing roustabouts, Wise Men, denizens of the towns and various animals with very human qualities as this most holy of stories unfolds with very profane yet hilarious results. On the outskirts of it all is Adam Rugo as a wandering minstrel. The Matthew Stuckel set design is spare but effective providing several playing areas and enhanced by Tyler Duenow’s lights. A blend of hippie chic and just outlandish outfits that don’t always fit the time but fit the characters are an inspiration by costume designer Alexandra Scibetta Quigley. It’s all well-paced madness and chaos that doesn’t quite fit the mold of everyone’s ideal picture of Christmas, but certainly gives us a viable choice in that more realistic alternative universe. “The Butterfingers Angel…etc., etc.” plays through December 21st at Stray Dog Theatre. Call them at 314-865-1995 for tickets or more information. Put the “daze” back in your holidays. This entry was posted on December 10, 2013 at 9:43 am12 and is filed under Uncategorized. You can follow any responses to this entry through the RSS 2.0 feed. You can leave a response, or trackback from your own site.